Version notes say it is changed in Beta 19. Beta 21 is current as of this writing. First, thanks a million for the effort! I use the "Vertical Tabs" add-in, and the tab heights don't work out very well; they overlap (see attached img). Can CTR fix this for me? I poked around the settings, but didn't find anything that seemed like it would help. Also, Tab colors don't seem to have any effect. Any thoughts there? As a work-around, Tab Mix Plus it has an option that changes the focus back to the website. TMP seems to play well with CTR. Which option are you referring to? If you are talking about the "Focus content when loading non blank page" option: it doesn't focus the website after opening a new tab via double-click. Hello Aris. Good work on the add-on. Ever since I updated to Fx29 it's been hell trying to get the browser to look as it once was. I'm having trouble getting rid of a 2px bar underneath the tabs bar. It's there if the URL container is in the tabs bar. I tried disabling my userscript but it's still there. I know it's part of the #nav-bar attribute, but I can't seem to find a way to get rid of it. Are there any solutions? I don't know if this has already been reported but I did try to search & find an answer. No luck. I *love* this Add-On! So thank you. Here's my one issue. When I go full-screen, the toolbar never disappears/hides. Is there a setting for that? This is only happening on Vimeo. YouTube is fine. Unsure what that's about! level20peon wrote: Which option are you referring to? If you are talking about the "Focus content when loading non blank page" option: it doesn't focus the website after opening a new tab via double-click. That is the option I was referring to. For me, at least, it removes CTR's focus on the URL and allows the focus code in the webpages to process. It works on IHome.com, Yahoo, merriam-webster.com and others I have tried. Google ignores CTR without any help. All of the non-search type web pages I looked at don't seem to have a focus coded, no matter how they are opened, even with other browsers. I'd recommend you have this thread locked and start a new one in it's place. Threads over 100 pages become unwieldy and difficult to manage. Plus, now that Australis is "official" and the extension has had several version changes, the old info in this thread doesn't really help any more. Your call. into all your styles trying to override CTR settings or it won't work. Even then it may not always work. I added /* AGENT_SHEET */ and I used Stylish. The codes now work, but unfortunately when I close and reopen Firefox codes not work. To run the codes again click disable style and click active style. Did you try the new Session Manager Version 0.8.1.2pre20140331b located at https://addons.mozilla.org/en-US/firefo ... /versions/ which was released for "Compatibility changes to work with Classic Theme Restorer add-on". Once again: ALL ids of ALL CTR items changed. This means after installing CTR, CTR does a full reset of your toolbar configuration (options are still fine). You HAVE to move ALL items again to their previous location using customizing mode. This is not because I want to fool with CTR users, but because I HAD TO change all ids. There is no way back. Of course you can still use 1.1.8 as long as it works. roy192 wrote: When clicking on 'Web Developer' in the application menu (the one that opens when clicking the Firefox button in the left upper corner), it used to toggle the tools (just like ctrl+shift+I does). But now it opens some silly developer toolbar (which is completely useless to me). Is there a way to change this back to 'toggle tools'? I don't like having to press ctrl+shift+I. You are right. This will be changed. Its focused on recent betas. gaberad2 wrote: Any chance of getting slight right tab border of default Australis tabs for the "Squared Tabs (australized)" option? Or is there some CSS tat can enable them? look for e.g. border-color: "hsla(0,0%,0%,.2) !important;"
Increase ".2" to ".7" for example. I'm finding that any value other than ".2" causes the thin black outlining to disappear completely, or sometimes to just turn white. But I'm still wondering if it's possible to get the black outlining at the borders, which right now is extremely fine and light, to become somewhat heavier or thicker. Thanks for any further ideas. Also, do you have any plans to get Classic Toolbar Buttons working for Mac? I think that might ultimately be the ideal solution. hsla(0,0%,100%,.1) means white color with 10% opacity. hsla(0,0%,0%,.3) means black color with 30% opacity. Look here how you can adjust your colors, you started experimenting anyway. Although I prefer rgba colors. Ton3 wrote: Amazing work on this add on. More then likely the only reason I'm still using Firefox after update 29. 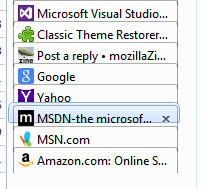 Any reason double clicking to open a new tab doesn't automatically enable you to type in the address bar? Recent betas allow you that. Lazy Jones wrote: Thank you, Aris. I've tried all three userChrome codes you have posted and one of them partially solved my problem. Quick reminder: the problem is/was about the line that goes from left to right, across whole Firefox window and is located just above an address bar. The line also "cuts off", actually goes through the top of some buttons i've put on navigation bar. This line of code removes the bar, however, line is still visible when navigation bar is hidden. Next line of code also removes the line, but it also completely hides the navigation bar and i can't get it back unless i remove the code from userChrome file. I'm using first line of code, but i would also like to have that line removed/hidden when navigation bar is hidden. Thank you and all others who might come up with a solution. Are you using some kind of autohiding code for nav-bar? What about this one, it hides nav-bar top borders for me. BRebey wrote: First, thanks a million for the effort! Use default Australis tabs in CTR, so "Vertical Tabs" add-on can use own tabs properly. How can this option be so popular...? mailboxman wrote: Hello Aris. Good work on the add-on. Ever since I updated to Fx29 it's been hell trying to get the browser to look as it once was. I'm having trouble getting rid of a 2px bar underneath the tabs bar. It's there if the URL container is in the tabs bar. I tried disabling my userscript but it's still there. I know it's part of the #nav-bar attribute, but I can't seem to find a way to get rid of it. Are there any solutions? Does this happen for anybody else? This is a good idea. Could you lock the thread right now after my post, so I can add a link to the new one right after I created it? Locking per Aris' request. Stay tuned for link to new thread.